In 1871, Woodland, the county seat of Yolo County, was home to merchants, farmers and ranchers, many of whom had been a part of the Gold Rush, but had found it more profitable to sell necessities to the miners. The ‘wheat boom’ (1872-1889) established Woodland as a center of agricultural wealth. Such was the environment in which the first Episcopal service in Woodland took place. Mrs. Craft invited an old friend, the Rev. Mr. Hill from Grace Church in Sacramento, to hold services at the Methodist Church, then located on the southeast corner of Main and Elm Streets. St. Luke’s Church was instituted as a mission in October of 1872. For the next 15 years services were held once or twice a month at the Methodist Episcopal Church, or the Good Templar’s or I.O.O.F. halls. By 1886, through the efforts of the Mite Society, the Building Association, the Ladies Guild, and the congregation, enough money had been raised to build a wooden church costing $3,000. The cornerstone was laid on September 15, 1887 and the first services in the new building were held December 31, 1887, with the Rev. Coffee Montgomery Hoge (1887-1893) serving as the first rector. In the first decade of the twentieth century, the congregation purchased three lots on the southeast corner of Second Street and Lincoln Avenue, the present church site. In 1911 the Vestry commissioned Professor William C. Hayes of San Francisco, a lecturer in architecture at the University of California, to design the Norman-style brick church in which we worship today. Construction by P.N. Schmidt Co. cost $12,000, with an additional sum of $3,000 for the imported English oak pews. The original St. Luke’s church and property was sold to the Second Baptist Church. The new church was dedicated September 29, 1912 by Bishop William. H. Moreland. The Trinity of beautiful windows of jeweled Tiffany glass was installed over the hand carved Oak Altar in loving memory of a long time generous benefactor of the church, Mr. Charles Nelson and the generosity of the vestry and laity enabled the Austin Pipe Organ to be installed between 1919 and 1925. Funds were raised in the amount of $6,300, and the Guild Hall was completed in 1928. The exterior was in the Tudor or Old English style. The interior was capped by a high vaulted ceiling and massive trusses. A new house costing $7,000 was built on the property which served as the rectory until the mid-1960’s. The Great Hall and Educational Complex were completed October 31, 1957, at a cost of just under $112,000. In 1965 the Parish established St. Luke’s Nursery School as a community outreach. It has continued to serve both the parish and community to the present. The last of the stained glass windows were dedicated in September 1974, thus finishing a project begun 52 years previously. The parish acquired the church bell that can still be heard ringing throughout Woodland and dedicated it on Easter, 1979. 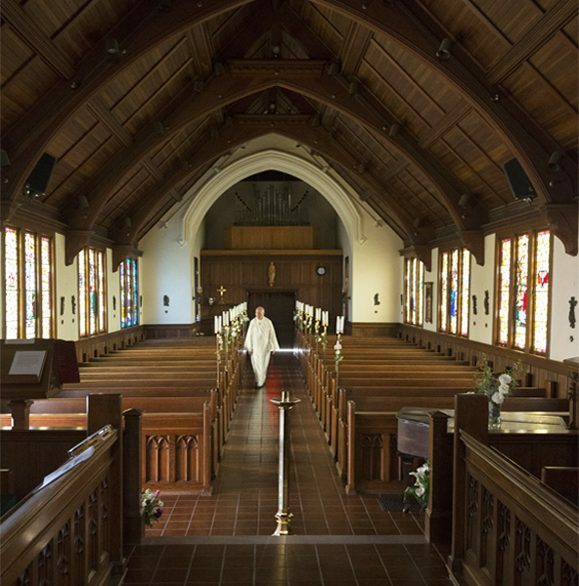 During this time the parish endowment fund was created, the organ renovated and enlarged, and there was emphasis on traditional liturgy and music.In the early 1990’s St. Luke’s to the register of historical landmarks by the Yolo County Historical Preservation Society.